Ever wish technology could cuddle? Not to worry, with these new gadgets, you can take care of business while enjoying cute, soft snuggles....or, if you prefer, bear torture. 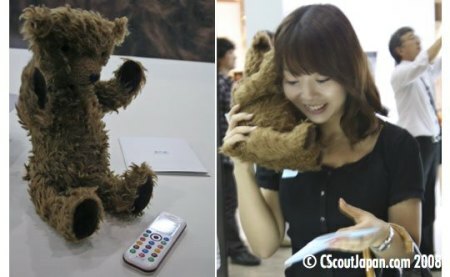 While the Kuma Phone , or "Bear Phone," is cute and silly, the teddy bear USB is a little morbid though surprisingly still adorable. Sure you may look slightly crazy while holding a teddy bear to your head and chatting away, but really, doesn't all technology look crazy at its inception? Personally, I would rather look nutso with a big ball of softness on the side of my face, than look "normal" with a boring box of plastic sweating up my cheek. As a technological bonus, you can have up to four numbers auto-saved in the bear -one in each paw. When you get a phone call, you hear a customizable ring tone and the bear vibrates. To answer or hang up, just push the tail! As far as dialing numbers, you've got me stumped. While $500 seems a little steep for a phone, think of all the love it can give you that a normal cell just can't compete with. Isn't companionship priceless? 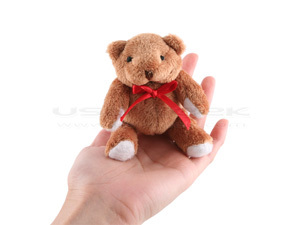 If you're the type of person who prefers a little hand-held teddy bear over a big cuddly one, or the type of person who enjoys torturing bears, perhaps the USB teddy bear is more your speed. To use, simply rip off the head, shove the bear body into your USB drive and enjoy watching your hub eat the little ball of fluff. Who wouldn't laugh while watching this cute, decapitated creature learn your precious computer data? Holding up to 1 GB of info would certainly qualify this guy as "smarter than the average bear." Whichever you prefer, cuddles or abuse, I'm sure you'll be getting lots of comments about the relative cuteness of your new technology. And you're certain to have lots of fun with your new buddy. 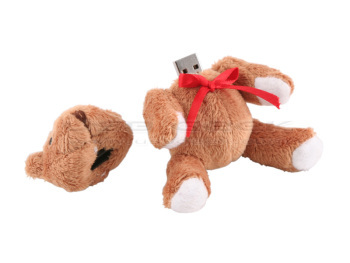 You can get the usb teddy bear here. Our guest blogger, Jill Harness, is a freelance writer in San Diego, California. She's an expert of the weird and a purveyor of the strange. Her blog is at RuetheDay.